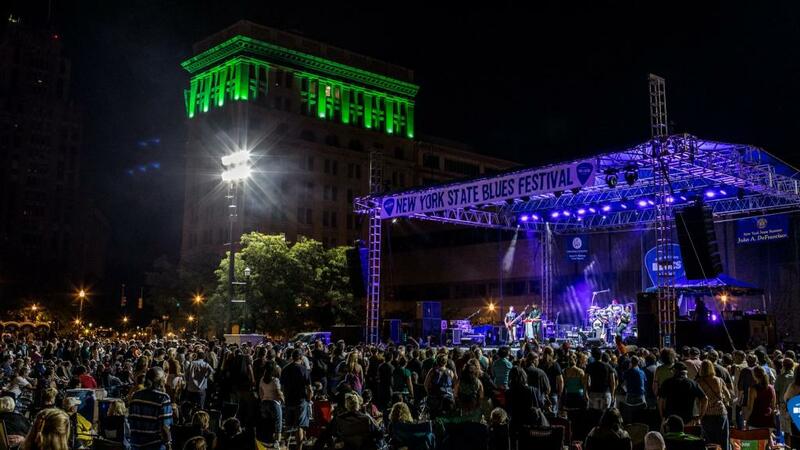 The New York State Rhythm & Blues Festival is almost here and will be taking over Clinton Square and filling the streets of Downtown Syracuse with the best in rhythm and blues. Watch as a large collection of regional and national artists perform one of America’s most unique styles of music right in Syracuse. The festival will take place June 28-30 and feature a variety of artists each day. In case you need any more convincing, here’s our top reasons why you don’t want to miss it! Yes, you read that right. This festival is absolutely free; making it the perfect option for a group outing or something you can even bring the whole family to. Take advantage of the opportunity to see a ton of artists you couldn’t see for free anywhere else and save your money for snacks and drinks from the many vendors present. Big blues fan or just really like catered meals? Then this is the perfect option for you. Buy a VIP package or just VIP passes for an individual day. Each day has a special catered menu by Dinosaur Bar-B-Que complete with finger foods in case you get hungry in between sets, all within the VIP tent. Grab a drink from the VIP bar and enjoy special seating where you can catch all the action from the best spots the festival has to offer! Because what goes better with blues than barbeque, beer and VIP seating? Want to attend the festival but don’t know where to stay? Fortunately, you can stay Downtown and walk within minutes to the festival. Try the historic Marriott Syracuse Downtown, the Jefferson Clinton or the Courtyard Syracuse Downtown at Armory Square. The hotels will be filled with fellow blues fans and even the artists themselves! For a complete listing of area hotels, click here. Want in on some pre-festival fun? Check out the Pre-Fest Party with Jack Broadbent at the Finger Lakes Ballroom inside Marriott Syracuse Downtown. Hailed as the “new master of the slide guitar,” Jack Broadbent is here to build the hype for what the festival will bring. You can buy tickets here. 5. Last but certainly not least- the music! Rhythm and blues artists from all over will come together for three days in Clinton Square to show you what the genre is all about. Headliner, Anders Osborne, is an act not to miss as he hails from New Orleans and shows Syracuse what the blues are all about. Popular supporting acts include Paulie Cerra and Larkin Poe. This is one of the largest free blues festivals in the Northeast, come join the action, get down and enjoy some world-class music in the heart of Downtown Syracuse!